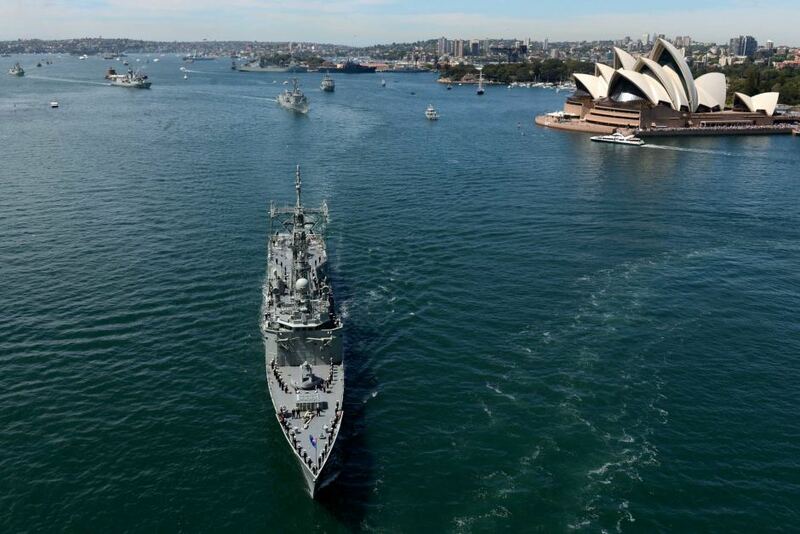 Early in October, the Royal Australian Navy International Fleet Review was held, celebrating the 100th anniversary of the first Royal Australian Navy fleet in Sydney Harbour, on October 4 1913. Around 40 warships from twenty countries, and 16 tall ships took part, with seven RAN ships symbolising the 1913 entry itself. A stunning fireworks display on the Harbour used huge projections on the Sydney Opera House to tell the story of our century-old navy. Although the Governor General Quentin Bryce reviewed the Fleet as the Queen’s Representative, it is traditional to have a member of the royal family in attendance for the Review, and Prince Henry of England, otherwise known as Captain Wales, or Prince Harry, got the gig. It was his first official visit to Australia, and although only here for 36 hours, he made himself immensely popular. The famous names this week are in honour of the Royal Australian Navy, and our royal visitor. Henry is from the Germanic name Heimrich, meaning “home ruler”. It has been commonly used amongst European royalty, and there are many rulers of Germany, France, Spain and Portugal named Henry, or one of its equivalents. There have also been six Holy Roman Emperors named Henry, one of them a saint. Other saints named Henry include a legendary bishop of Sweden, and Henry of Coquet, a Danish hermit who lived on an island off the coast of Northumberland. Henry is a traditional name in the British royal family, and there have been eight English kings named Henry. Henry I was the son of William the Conqueror, and probably named after his great-uncle, King Henry I of France. The last king named Henry was Henry VIII, who is best remembered for his six wives, and for the English Reformation, which saw the Church of England break away from the Roman Catholic Church and the pope’s authority. In his prime handsome and powerful, he is considered to be one of the most charismatic of English rulers. There have been a few British princes named Henry, and Prince Harry may have been named after his great-uncle Prince Henry, the Duke of Gloucester, who was Governor-General of Australia, and married to Princess Alice, whose middle name was covered in Rare Royal Names for Girls. Some people find it hard to understand why Harry is a short form of Henry. In the Middle Ages, Herry or Harry was how the name Henry was pronounced in England, so anyone named Henry was automatically a Harry once their name was said aloud. Today the medieval Harry is used as a pet form of Henry. It is sometimes forgotten that Prince Harry’s official name is Henry, so that when he was introduced as an ambassador of the 2012 Olympic Games, some viewers wondered who this “Prince Henry” chap was. Bizarrely, one online news source (now removed) even reported that Prince Harry and Prince Henry of England attended the closing ceremony together (well, I guess they did, in a way). Henry is a classic name in Australia which has never left the charts. It was #11 in the 1900s, and gradually fell until the left the Top 100 in the 1950s, hitting its lowest point in the 1970s at #265. Since then, it has gradually climbed, and was back on the Top 100 by the 1990s, where it has continued to increase in popularity. It isn’t shooting up dramatically, but making steady gains. Currently it is #33 nationally, #27 in New South Wales, #23 in Victoria, #35 in Queensland, #17 in South Australia, #33 in Western Australia, #15 in Tasmania, #19 in the Northern Territory, and #10 in the Australian Capital Territory. Henry is a handsome classic that seems intelligent and solidly unpretentious. It’s a popular name, and rising in popularity, but in a sensible, steady way. It seems unlikely at this point to match Prince Harry’s brother’s name, William, in the popularity stakes, and get to #1. Navy is an English vocabulary name; the word navy refers to a fleet of military watercraft. Although navies have been used since ancient Greek and Roman times, navy is quite a modern word in English, dating back to around the 17th century, it is from the Old French meaning “fleet of ships” – ultimately from the ancient Greek for “ship”. You can also see Navy as a colour name, since navy blue or navy is the very dark blue named after the traditional colour of naval uniforms. Navy has been used as a personal name since the very late 18th century, and is first found in the United States, more specifically New England. The births of the first babies named Navy coincide with the establishment of the US Navy in 1794, so it seems to be a very patriotic name, and likely to be given to children of people connected with the navy itself. Navy is much more common in the US than anywhere else, although rare in America too, and overall it has been given to boys and girls in fairly equal numbers. It is an extremely rare name in Australian historical records, and seems to be slightly more common as a girls name here; I have only ever seen Navy on girls, but so infrequently that it seems an entirely unisex name. Rare, unisex, and rather modern, the name Navy would honour a naval connection in the family, or a family naval tradition. POLL RESULTS: Henry received an astonishing approval rating of 95%. Navy received a more modest approval rating of 25%.